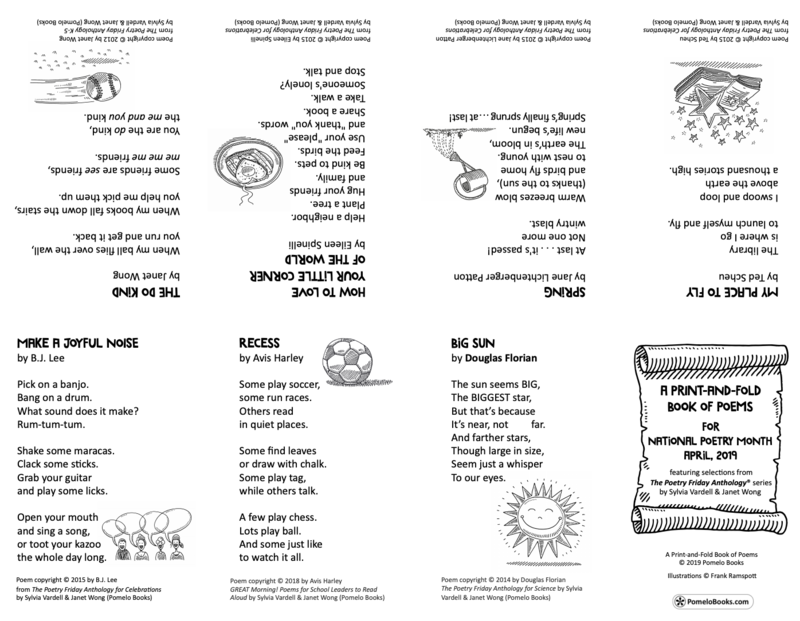 It’s our pleasure to feature exclusive bookmarks and a booklet for National Poetry Month! Features poems from The Poetry Friday Anthology series by Douglas Florian, Avis Harley, B.J. Lee, Jane Lichtenberger Patton, Ted Scheu, Eileen Spinelli, and Janet Wong. You’ll find poems about the library as a place to “launch myself and fly”; Spring and sun; helping neighbors and loving your little corner of the world; being the “do” kind of friend; joyful noises; and recess! Find out more about this great series here. Click here to download and print the 2019 booklet! 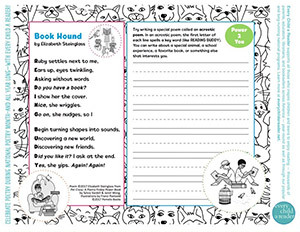 Featuring the poem “Book Hound” by Elizabeth Steinglass and illustrations by Franzi Paetzold, this year’s bookmark includes a space for children to write their own acrostic poem! This poem is from Pet Crazy: A Poetry Friday Power Book, an anthology of poems by various authors. 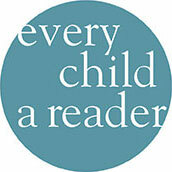 Find out more about this great book here. Click here to download and print the 2018 bookmark! You can also download and print the 2017 bookmark. It features 2 poems, “Blue Bucket” by Naomi Shihab Nye and “Here We Go” by Janet Wong. These poems are from Here We Go: A Poetry Friday Power Book, an anthology of poems by various authors. You can find more about it here. 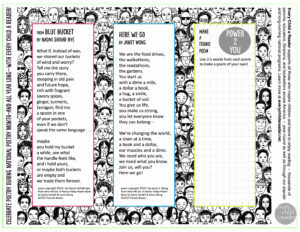 The bookmark also includes a space for children to write their own poem and get them in the poetry writing spirit! The artwork was done by Franzi Paetzold and was designed by Janet Wong. Click here to download and print the 2017 bookmark!